Playing Descent: Journeys In The Dark (1E) can be an exercise in confusion, especially when one has several conditions in play, is a Necromancer, and is wandering through a trapped dungeon. 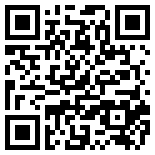 My second app for Android, built using App Inventor, is designed to make such checks fast and error-free. 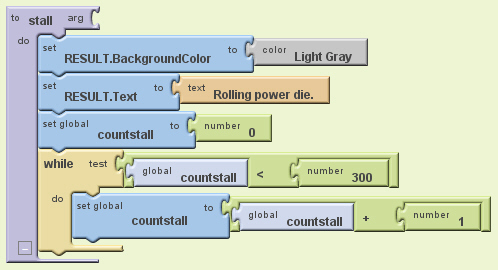 The app is simple enough: click the condition button and it checks against one of three subroutines, as appropriate to the particular condition: rollBlank, rollSurge, or rollPowerEnh. Based on whether TRUE or FALSE is returned by the subroutine, a specific message is displayed in the results area at the top of the screen. The RESULTS text change, however, does not work properly, no matter where I call for it (even if I make the text change its own procedure). I have to assume that this is a bug with App Inventor, because the exact same calls are used to make the results area change its text based on check results, as well as its background color (green for good-for-the-user results, red for bad-for-the-user results). Descent: Journeys In The Dark is ™ and ©2011, Fantasy Flight Games, all rights reserved. 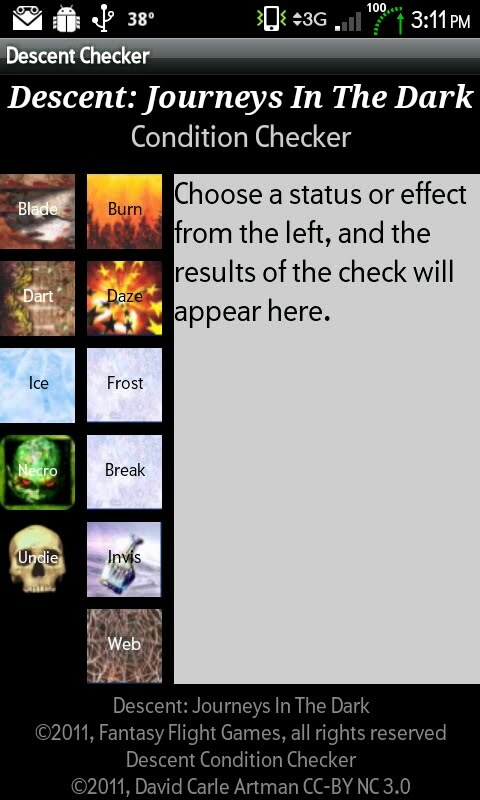 Descent Condition Checker For Android app is ©2011, David Carle Artman, CC-BY NC 3.0.